In a large bowl (I used my mixer bowl) whisk together flour, yeast and salt. In a pan, heat milk until just warm, remove from heat and add honey and butter. Stir until melted. Add to flour, and mix with dough hook until dough is smooth and elastic. Cover the bowl with plastic wrap and set in a draft-free location overnight or for 12 hours. Put a cast iron griddle on the burner over medium heat. Turn oven on to 350°F. In a small bowl, mix cornmeal and flour. When the griddle is hot enough to sizzle water dripped on it (350°-375°F), dip a serving spoon in water, then gently scoop out 1/6 of the dough. Place dough in cornmeal mixture and turn over. When evenly coated, gently shape dough into a round and place on griddle. 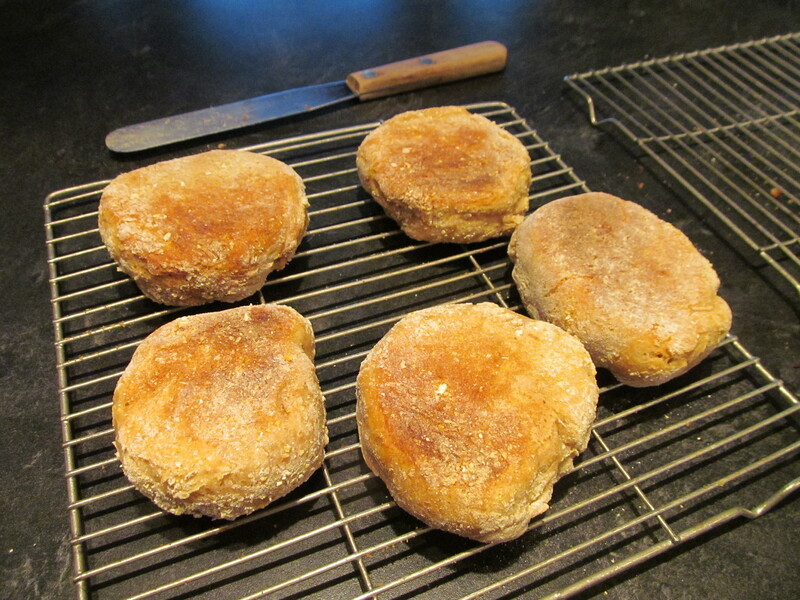 Repeat until all the dough is used, and turn the heat to low (this should make 6 muffins). Cook for 10 minutes, lifting muffin halfway through to assess browning. Muffins should be a deep golden tan at the end of 10 minutes — you may need to adjust the flame. When muffins are nicely browned, gently flip and cook for another 10 minutes, then remove from griddle to a baking sheet and finish in the oven for another 10 minutes. Cool on a rack. I found this recipe kicking around in the pantry. I’d printed it from somewhere, sometime, but I now don’t know where I found the recipe. It is simple and easy. I used 50% Sifted Whole Wheat Flour from Maine Grains, a new local grist mill in Skowhegan, Maine. The verdict? Delicious, but they were not as holey as I would like, so I need to do some research to see if I can solve that problem. Look for more about Maine Grains and my recent tour of the mill on Henbogle. Heat oil in heavy large pot over medium-high heat. Add onion and cook until onion is tender, about 6 minutes, add garlic and stir until garlic is fragrant but not browned. Add rice and stir until rice is translucent, about 2 minutes, then water/stock and wine and bring to boil. Reduce heat to low; cover and cook until rice is almost tender, about 15 minutes. Mix in spinach. 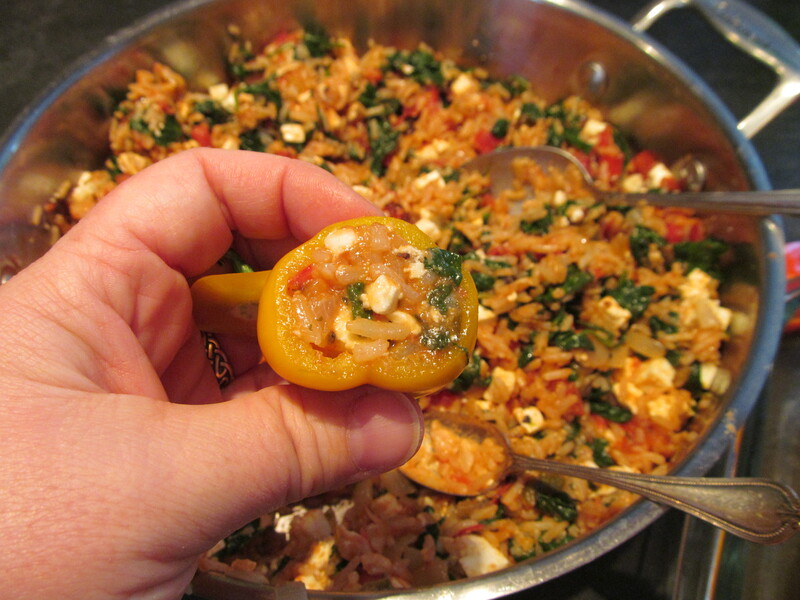 Cover and cook until rice and spinach are tender and all liquid is absorbed. Remove from heat and stir in tomatoes and cheese. 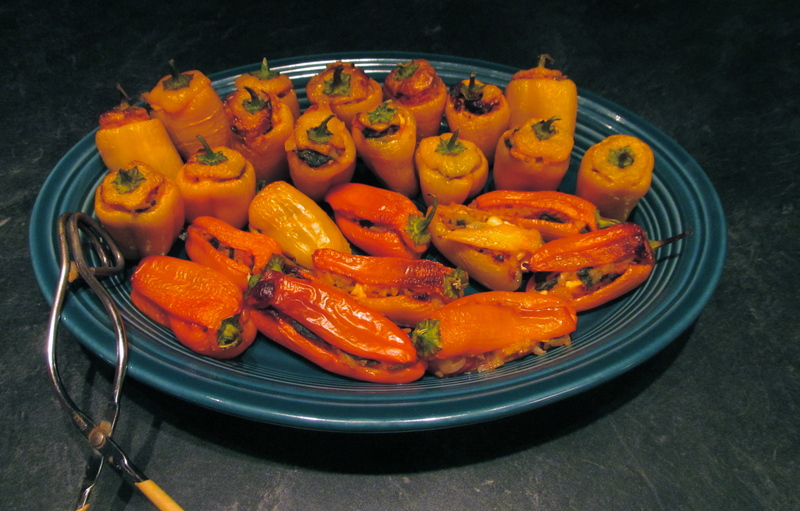 Cut tops from baby peppers (keep stems on tops) and reserve. Cut a very thin slice from bottom of each pepper so it can stand upright (don’t worry if you make a hole in bottom). Scoop out and discard seeds and ribs. Fill each pepper with rice mixture and add reserved top. 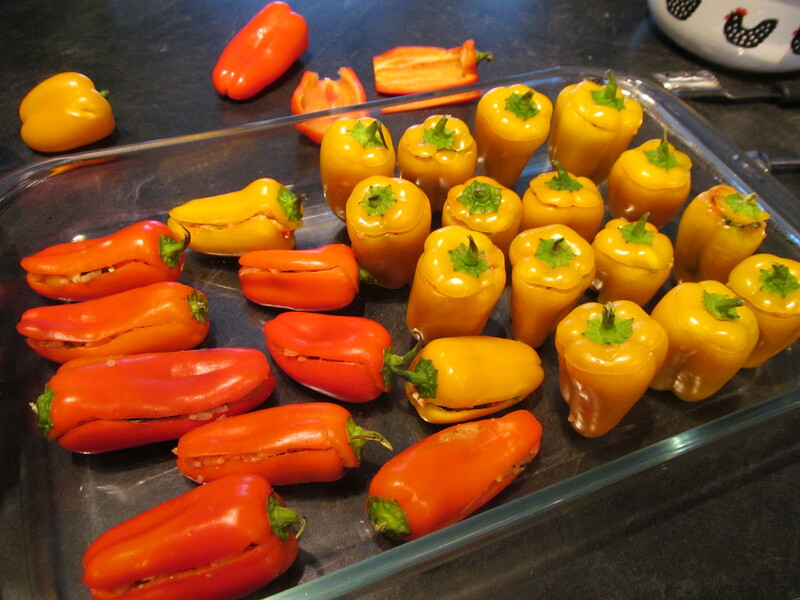 Arrange peppers upright in an oiled baking dish. Add water to dish and bake, uncovered until peppers are tender about 50 to 60 minutes. Transfer to serving platter. If there is leftover filling it is great on its own or use as a base for burritos. These are remarkably tasty — I think it is the ratio of pepper to filling. I made them for a party and they seemed to disappear. Preheat oven to 400°F. Stir together flour, sugar, baking powder, salt and baking soda into large bowl. Cut in butter. Add buttermilk,stirring gently until clumpy. Turn out onto floured board and knead until dough comes together. Form into a round for large wedges, or a rectangle for smaller wedges. Cut into wedges and bake until lightly browned, about 25 minutes. Parchment paper is great for scones if you can find it. 3/4 +/- dried cranberries, mini chocolate chips, dried cherries, pecans, currants, etc. I found this fantastic kale salad online on the Epicurious. In a bowl, whisk juice, shallot, honey, salt and pepper flakes. Add kale; toss well. Let sit 20 minutes. Mix in oil. 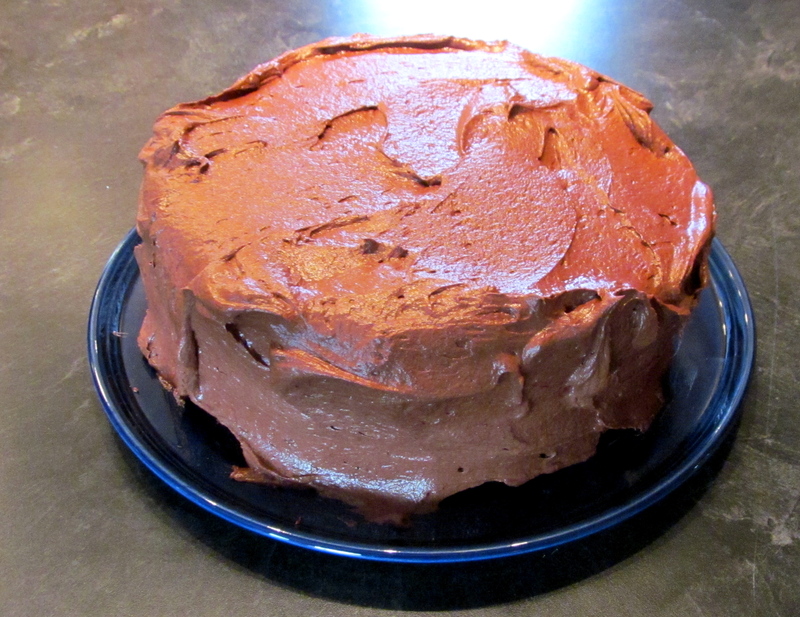 Refrigerate for up to 1 day, or serve immediately. Toast almonds until color deepens and they are fragrant. Add almonds, dates and Parmesan to kale; serve.